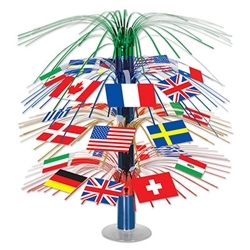 If you are looking for international decorations for a world party you have come to the right place. We have created this special category just so you can easily find all the foreign decorations and party supplies you could want. From international centerpieces for an international games party to alpine hats for an Oktoberfest party, we can help you create a custom world party theme. All of our world party supplies are further classified by their countries or regions. Paris themed birthday parties and bachelorette parties/bridal showers are becoming more and more popular! Decorate them with some of our great French decorations! From eye-catching Eiffel towers to Fleur Di Lis decorations, we've got it all! If you're planning your next diverse world party, we have the decorations to make your party complete! Whether you’re celebrating your heritage or rooting on your favorite international soccer team,Our most popular decorations for world parties are our line of International decorations. The International decorations also have a variety of hanging and wall decorations to choose from to decorate your room. Our International Flag Ceiling Decoration features many of the same flags of our International Flag Cascade Centerpiece. This ceiling decoration measures 12 inches by 12 feet and is made of plastic. This hanging decoration will be an eye-catching decoration at your world party. Everyone is going to love it! Browse through all of them to see which ones you want at your world party! If you want to order one of everything, we don’t blame you! The more the merrier at your world party! Go ahead, dive on in and explore our extensive selection of world party and international party decorations and supplies. We’re PartyCheap.com and we know how to party!